In four years, 7,000 cases of torture were reported, but the number could be much greater, said David Sanchez, human rights defender. The practice of torture by security forces in Mexico is out of control, human rights defender David Sanchez told teleSUR on Sunday, adding that complaints by victims of cruel and unusual punishment by police and military have increased by about 600 percent compared to 2003. “In 2013 alone, the National Human Rights Commission (CNDH) reported at least 1,505 denunciations by victims of torture, which is 600 percent more than 10 years earlier,” said Sanchez, who worked for the Committee Against Torture and Impunity (CCTI) for many years. The human rights activist said cases of torture could be much higher than reported, as many victims prefer not to denounce crimes against them out of fear and out of frustration because authorities have a track record of not investigating, much less sentencing cases of human rights crimes. “The fact is that in all the history of human rights violations in Mexico, only one case has actually ended in a sentencing. All other case of torture go unpunished and this is a deterrent for people to lay charges,” he said. Sanchez expressed concern that “those who resort to torture, are shielded by an almost absolute state of impunity. Cynically, the Supreme Court has reported 123 trials in cases of torture between 2005 and 2013, admitting that only seven resulted in sentences against the perpetrators. However, justice officials have only been able to produce evidence of sentencing in one case, said Sanchez, while suggesting that under President Enrique Peña Nieto, the government has returned to policies of repression. 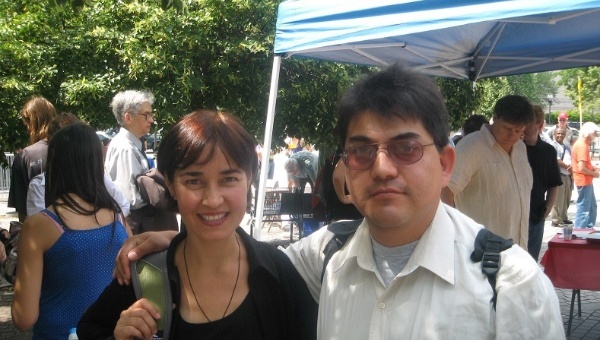 Recently, Edith Escareño, a CCTI activist, also said there is prove of sentencing in only one case of torture in Mexico. “We asked the Supreme court to provide documentation of the seven cases it claims resulted in sentencing, however they have only been able to prove one case,” she told teleSUR. David Sanchez suggested that the international community has expressed apathy toward the human rights situation in Mexico because the United States may be interested in making sure Mexico remains under a situation of chaos and violence. “Washington thrives on promoting destabilization within the countries it wants to control because of the economic interests it has in the region,” he added. Sanchez criticized the U.S. government for declaring Venezuela a threat to its national security. “Mexico is a true threat to the United States’ national security. This is real because we are their direct southern neighbors and we export drugs and violence to their territory, and Mexico also poses a threat regarding the possible smuggling of terrorist into their country. This is a real threat,” he said. He accused the Mexican government of hypocrisy and of projecting a false image of respect to human rights by implementing new laws that in practice have proven to be useless in protecting the rights of victims. When asked why international organizations apparently do very little if anything to pressure the Mexican government regarding human rights, Sanchez said, “The United States is responsible for this, because among other things, it has reduced its contributions to the United Nations and the Organization of American States, thus decreasing their budget for human rights issues.” The human rights defender also accused the government of intimidating activists. “I know of many cases where human rights activist receive death threats that are obviously made by government entities. CCTI’s website was blocked on various occasions. My phone has been tapped by the government various times and my email blocked as well,” he said. Sanchez directly accused President Enrique Peña Nieto of promoting impunity and repression in order to ensure the population feels intimidated against staging major protests. Recently, Sinaloan human rights expert Oscar Loza Ochoa told teleSUR that torture was a practices in Mexico that was on the rise, and that cases were being reported on a daily basis in every state of the country. “The situation of torture is out of control and the government is not only not doing anything about it, but it is making sure this cases do not become publicized,” Loza Ochoa added. The report also revealed the number of murders relative to the number of homicide prosecutions in Mexico has doubled to 3.34 in 2013, from 1.45 in 2006. The NGO also said that the sentencing rate for all crimes halved between 2003 and 2014 from 210 sentences per 100,000 crimes to 104 per 100,000. After considering these figures highly disturbing, IEP pointed out that such levels of impunity underpin the high public perceptions of insecurity and violence.